Please note: Tickets are limited In the first instance please would members only book one pair, and contact May Gibson, should you require further seats? Thank you. 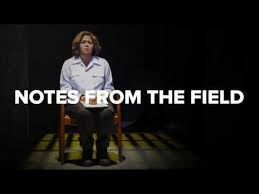 Drawn from over 250 interviews conducted with students, parents, teachers and staff, Notes From the Field is an Obie-Award-winning solo performance by writer and actor Anna Deavere Smith (West Wing, Nurse Jackie) that shines a light on a lost generation of American youth, chronicling their experience of being caught in a school-to-prison pipeline. A multi-award-winning dramatist with an honorary degree from Yale, this is Anna's first appearance in London in over 25 years. Anna is a multi-award-winning dramatist and a recipient of the MacArthur Fellowship, Fletcher Foundation Fellowship, and Fellow Award in Theatre Arts from United States Artists. As an actress, she has appeared in several films, including Philadelphia (1993), Dave (1993), The American President (1995), Rent (2005), and Rachel Getting Married (2008). Anna also had recurring TV roles on The Practice (2000), as Dr. Nancy McNally on The West Wing (2000–06), and as hospital administrator Gloria Akalitus in the Showtime dark comedy series Nurse Jackie. She has received honorary degrees from many American Universities, including Yale. Following the performance, Anna will be in conversation with Young Vic Artistic Director Kwame Kwei-Armah, which will be free to all ticket holders to that evening's show.